I was wondering if you will be making the 2.5 inch round badges available to those that donated to your crowd funding campaign for the Happy Saints A to Z e-book? 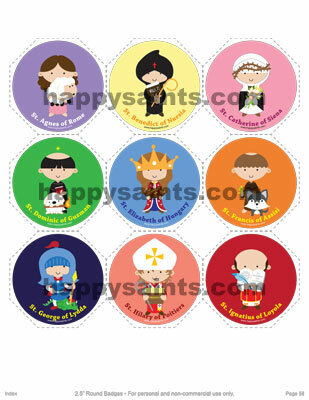 If not, will you offer a separate option to purchase the round badges that match the 26 Happy Saints A to Z? Plus, I want to let you know how happy and pleased I am with your work. I am in the middle of creating a card game to use on All Saints Day with the A to Z cards within this e-book. Hi Jamie, thank you for contributing! Yes I can send the updated ebook on request to those who have previously contributed or purchased the older version. Can you send an email to victorteh(a)yahoo.com so I can confirm your email? God bless!